What if Matt Groening had set his show in Twin Peaks instead of Springfield? Adrien Noterdaem gives this other set of TV oddballs The Simpsons' trademark overbites and yellow pallor. 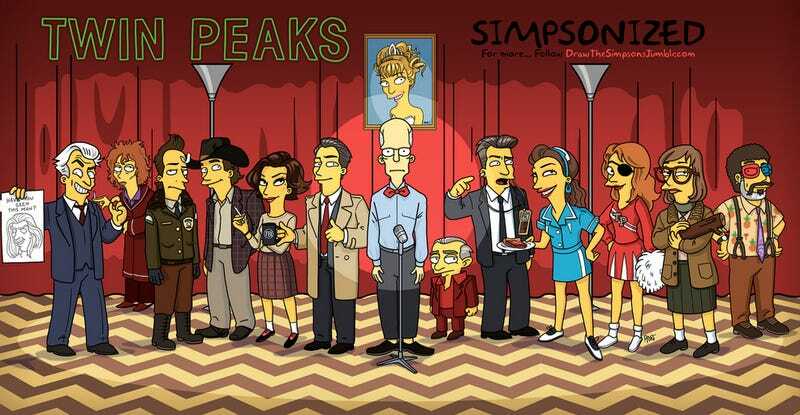 Noterdaem "Simpsonizes" various characters, real and fictional, at his Draw the Simpsons blog, and his most recent project is taking him through the cast of Twin Peaks. If you like this particular television mashup, you can grab a print of the image above (without the text) through Society6.